Take a relaxing, scenic dolphin tour by waverunner! We have the experience to take you to the best spots in the area where you can see many of nature’s attractions. 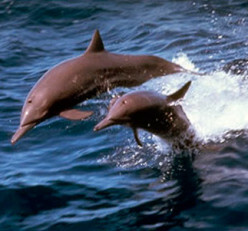 Our guides are knowledgeable of the local wildlife, dolphins and manatees. They know the area so well they will lead you to the best viewing areas. Mid Island Water Sports has the two best island locations for the dolphin tours hands down! Our close proximity to the dolphins natural feeding areas gives the riders the most viewing time to see them in their natural, uncaged freedom often just a few feet away from you. 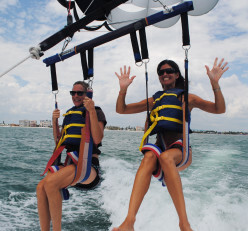 Tours begin on the Gulf side of the Beach and go as far as Bonita Springs through Lover’s Key. While in the Back Bay area, you’ll travel near Estero Island’s mangrove forests. These provide the chance for an up-close look at plant life and wildlife such as dolphins, birds, fish and rays. We generally come across pods of dolphin and occasionally even a manatee. 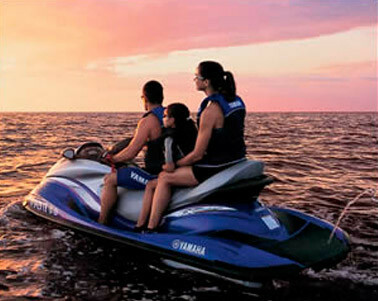 Sit back on your jet ski and view the wildlife in her natural habitat and take in all beauty! The tour lasts at least an hour and a half and is the best way to explore the island from the water with an experienced local to guide you! Travelers return year after year to repeat the tour because it never disappoints. It is the perfect mix of an eco tour and exciting family fun. Make sure to book at least a day in advance, though. We want to be sure you don’t miss your chance!